The subject of lamassu is a statue depicting a hybrid creature with a man’s head, a lion or bull body and bird wings. 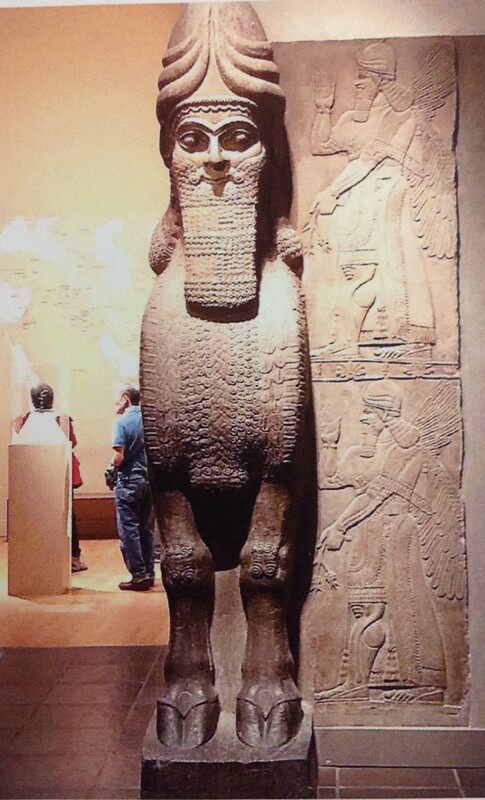 Lamassu is a guadian of gates in royal palace. There is intricate line work in the beard and fur, as well as lots of linear lines in the feathers. The statues mirror each other on either side of the archway. Looking at the statute from the front, it looks like it is standing still. From the side, the statue displays movement. The brow casts a shadow over the eyes. The chest is protruding out from the body, casting a shadow over the legs. There is no colour on the work, however there are theories that pigment was used. Our attention is drawn to the texture of the beard and fur because it is much more intricate than the rest of the work. Although it is a hybrid, it is fluid. From the side it appears asymmetrical. There is repetition in that the work is mirrored on the other side of the archway. The use of stone is imperative on a a work this scale,because using a medium such as clay would likely crack. The effects achieved are able to be replicated in other mediums such as other stones or metals. There is no other medium used. Because it is in stone, the work comes across as cold. The statues have a sacred feelling , because people in that period are trusted that Lamassu can fight with demons and protect them. They are also quite large, evoking a sense of power.